Greetings, everyone! I am so excited to be here and so thankful to each and everyone who is going to share some of their time to read or follow my postings on this blog and all over my social media channels. Simply put, I am a rock music enthusiast, who is just trying to keep great music alive. I was born in a family of musicians and been in the industry for as long as I can remember. My rock music adoration and fandom have developed into something more serious the moment I decided to combine my passion for rock&roll and my degree in mass communication. My goal is to educate people on important rock musical topics and to present the latest news happening with our beloved rockstars. In addition, I’m a keen record and CD collector. “My Rock Mixtapes” is a brand I created in order to share all my knowledge of rock music to the many fans around the world. Starting as a blog and expanding into a whole Internet rock brand, this project introduces my favorite artists, songs and albums of the last 30-50 years with the goal of presenting more personalized approach to music, introduced by someone who represents the newer generations of rock music fans. I don’t stick to old ways of reviewing, promoting and writing about musician, albums and the industry in general. I utilize new communication technologies and always approach things with love and creativity. “My Rock Mixtapes” is a blog that features many different types of posts, all aimed at engaging the readers and contributing to the rock community of the world. Throughout the past year, my contents have been shared on social media channels of world-wide famous rock acts like Nazareth, Warrant, Def Leppard, Survivor, Sebastian Bach, Jack Russell, Inglorious, Monster Truck, Riverdogs, Glenn Hughes, Helix, Yngwie Malmsteen, Kansas, Mr. Mister, Jeff Pilson, Joe Lynn Turner and many more. On social media, I am followed by many renowned labels, artists, bands and industry personnel. I look forward to the future and for finding my place in this industry. If you wish to contact me, please redirect to the SNS page of the blog. Rock Rock Till You Drop!!! Please do not make this email public . Interested in you goals and maybe a chance at a business proposition. Greetings from Eastern Europe, Velina! Congrats on the great blog. 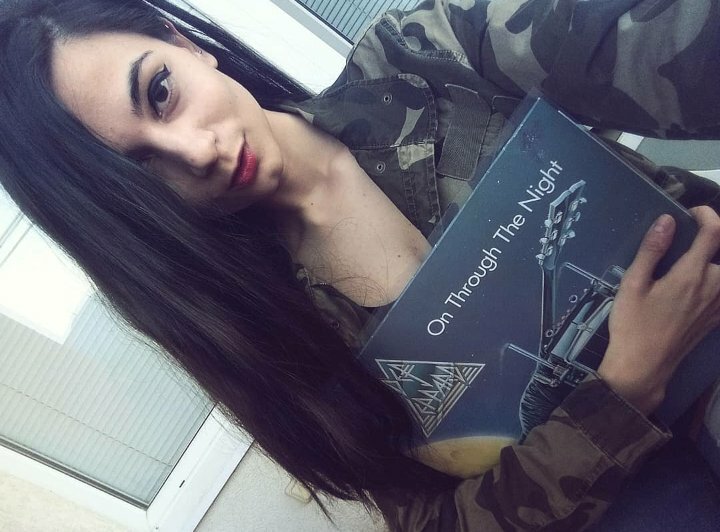 It`s been quite some time to see a girl with such an extensive knowledge in 70/80/90s rock music! I was searching for a t-shirt of the “Prisoners in Paradise” album by Europe and found you on Google`s organic search results. Although many of the albums are well-known to us die-hard fans there are still hidden gems to be discovered. I do this every once in a while but after finding this site i do it more often. “Where do we go from here” by Strangeways for e.g. is my top track last few days thanks to a review of yours. I would like to recommend you add a new section or just album reviews of more instrumental oriented rock from the 80`s if you find it attractive. You can add images of concerts you have attended, blog about the experience. Include some words or separate article about the greatest covers of albums – who created them, what they represent. Or you could make articles about say best solos in 70/80/90`s (which can help readers discover new bands), best rock songs for parties, different moods or whatever you can think of. You can be selling t-shirts or other band -related products on this site or a new one as ebay/amazon/alibaba affiliate. Thank you so much for visiting and enjoying my blog 🙂 I am also grateful for all of the insightful suggestions! I actually have a couple of publications, dedicated to concerts I’ve been to. I have publications about famous album artworks and the meaning behind them…also a separate one for Roger Dean who is..the best :)) But I would love to do more articles on other famous album covers! I have many many playlists on my blog too, I hope you found them pleasing – I might do one specifically for partying ^^ so thanks for the advise, would be a cool thing definitely! Cheers and lovely to meet you! Follow me on Twitter, we can talk more there! I sent the above with the idea of a PM message but it turns out it will be public. Sorry for this. Let it remain private if more appropriate. Нямам много Българи, които ме следват 🙂 Радвам се! Also, love to see a review of an album or two by Gary Moore & Stevie Ray Vaughan as both of were my favorite guitarist alongside Matthias Jabs & Rudolf Schenker of Scorpions. Loved reading your blogs. I found it because I wanted to know more about Toto’s Hold the Line, and your blog helped immensely with that! Classic rock was my first true love and I’m still obessed with it. For new music my current fave is Half Moon Run’s Nerve. For older I really cant pick, but I do play The Stones’ Beast of Burden the most.